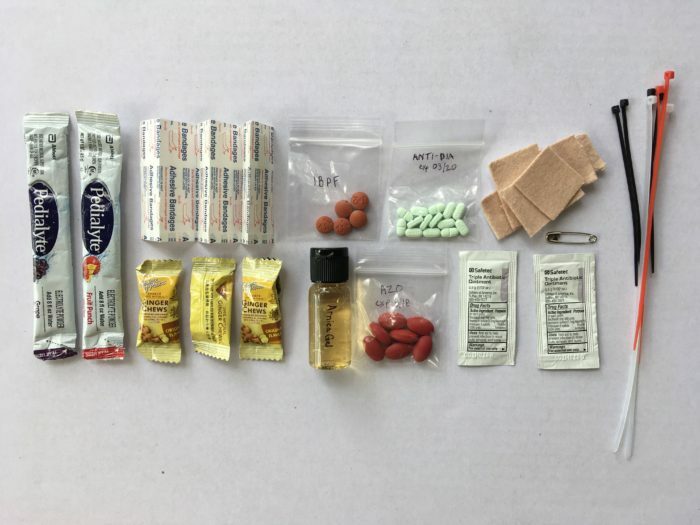 Everything in my medical kit is only meant to hold me over to the next exit point, not for me to be able to keep hiking while I’m sick or injured, therefore I’m keeping it minimal. I’m sure it’ll change as I go so I’ll post an update at then end of my hike with anything else I add (or ditched) along the way. I first heard of this stuff in Carrot Quinn’s book. I have yet to try it but the Amazon reviews make it sound like a miracle treatment for backpacker pain. It’s derived from an herb and is unscented. It comes in a 2.6 oz tube but I’m carrying 0.5 oz of it at at time. Ginger is a natural anti-inflammatory and is also good for nausea. I plan to eat one of these in the morning, mid-day, and before bed to keep inflammation down rather than popping ibuprofen. This is something new I’m trying out this trail so I’ll let yall know how it works for me. I’ll still carry a few pills in case the ginger doesn’t work. This, along with the following two pills mentioned below are stored in mini-zipper bags instead of pill bottles or blister packs. This was suggested from the short-lived but super informative Women in the Woods podcast. Dehydration, funky conditions in your underpants, and trail secks make you more prone to UTIs. I cannot think of anything more unpleasant than an on-trail UTI. I’ll pop one of these if there’s the slightest indication of a UTI. No, thank you. Tied in first place for unpleasantness is getting diarrhea on trail. But beyond being unpleasant, getting diarrhea is also extremely dangerous because it quickly dehydrates your body. Fingers crossed but blisters haven’t been an issue for me. Thanks, Injinji. I’ll still keep a few of these in my kit just in case. This is from a big cheap roll from Amazon. For blister lancing and gear snafus. Always handy to keep a few of these with you. A couple single-use packets of this stuff taken from a pre-assembled medical kit. I’m not bringing any regular band-aids. If I get a boo-boo, I’m not going to bother with even stopping to cover it. The body is good at fighting infections for small cuts. However, I do want to be ready for more serious cuts. I’m already going to be carrying Amazing Grass electrolyte tablets to use regularly but I’m going to keep a couple of these Pedialyte powder packets in my medical kit as an emergency stash. Not really a medical item but I’m keeping a few of these in my kit for repair. I’ll probably end up ditching them but they were an impulse purchase at Dollar Tree when shopping for other first aid kit items. My entire med kit weighs 1.8 oz. I’m counting only the arnica gel and ginger chews as consumable. Peep my LighterPack here and keep an eye out for the rest of my gear posts.